Since the early days of the industry, car companies have used a variety of animals as mascots and hood ornaments as well as in their logos and promotional materials. Long before Ford called a sporty car “Mustang”, Sir Lyons renamed his company Jaguar. Lyons used a cat, perhaps an idea taken from Edsel Ford, who put a dog, a leaping greyhound, on his Lincolns. Delage used greyhounds as well, but some of their hood ornaments were elephants. More famously, Ettore Bugatti fitted each of his Royales with an elephant hood ornament sculpted by his brother Rembrandt. I recently saw these and many other animal ornaments and mascots at the Classic Car Club of America’s museum on the grounds of the Gilmore Car Museum. Animals don’t just show up in the car world as classy hood ornaments, though. Auto dealers, part stores and car washes are known for renting giant inflatable gorillas, lizards, and even fish, to attract attention to their businesses. 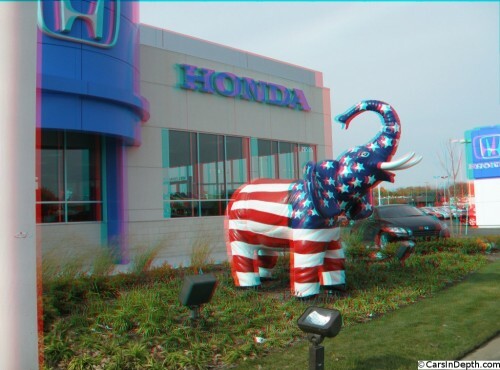 So it shouldn’t be that surprising to find an American flag painted life size elephant in front of a Honda dealer in suburban Detroit. Still one wonders just what an elephant has to do with selling Hondas. Actually, nothing. 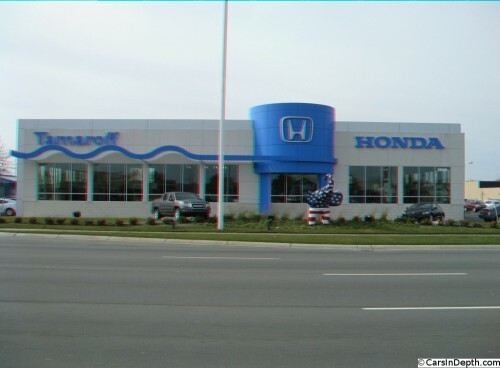 I suppose the red, white & blue flag motif is supposed to say something about the Marysville built Accords that they sell there, but the patriotic paint was applied long after the elephant first appeared in front of that building. Actually, that elephant has been standing on Telegraph Road since before that was a Honda dealer, in fact before Honda had any car dealerships anywhere near Detroit. It doesn’t really have anything to do with Honda, but it is an artifact of an earlier attempt to sell import brands in America. The Tamaroff family, like many of those in the car dealership business, owns a number of stores, representing Honda, Acura, Nissan, Infiniti, and Kia. They used to own a Buick store but that went away in GM’s bankruptcy and dealer culling. That’s a bit ironic since the entire dealership group was founded with just that Buick dealership, when it was called Tamaroff Buick, Marvin Tamaroff’s first new car dealership. As you can guess, the Tamaroffs were quick to recognize the business potential of imported cars, even in the Detroit area. Of course the decision to sell foreign cars was eased by the fact that just a few miles away at the General Motors Building, GM had decided to compete with the VW Beetle in America by offering products from its own German subsidiary, Opel, through its Buick dealer network. So why an Elephant? You’ll have to ask whichever ad agency had the Buick account in the mid 1960s. Though Opels had been on sale in the US since 1957, it was with the introduction of the Opel Kadett in 1964 that most Americans became aware of the brand. The Kadett was not a very big car to begin with, and sitting in Buick dealerships next to American land yachts only accentuated the subcompact’s diminutive dimensions. To offset consumer concerns that the Kadett was not up to driving on American roads, in American traffic, the car was marketed as the “Mini-Brute”. In much of the advertising, the Kadett “mini-brute” was juxtaposed with a “maxi-brute”, an elephant. Elephants appeared in print ads, television commercials and in front of Buick/Opel dealerships. In this 1968 Kadett commercial, they combined elephants and celebrity endorsements, with Tarzan’s Johnny Weismuller taking his Opel to an elephant car wash, bring Cheetah the chimp along for the ride. After the Kadett, and then the entire US Opel line was dropped from GM’s plans for America in the 1970s, the Opel elephants started to disappear from in front of Buick stores. The Tamaroff’s elephant, though, has remained, ever vigilant over Telegraph Road construction and traffic, for over 40 years. I don’t think that has been a coincidence. 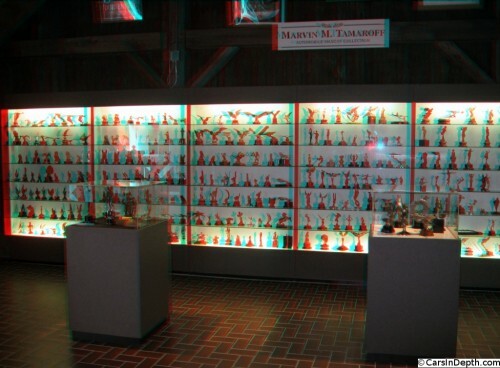 You see, that collection of hood ornaments, many of them zoological, in the CCCA museum, is known as the Marvin Tamaroff Mascot Collection, a donation from Mr. Tamaroff. It appears from the statue of an elephant in front of his family’s Honda dealership, that he didn’t just collect small mascots. This entry was posted in 3D Imagery, 3D Photos, Advertising, Automotive History, Buick, Opel. Bookmark the permalink. Pingback: PJ Lifestyle » What’s a Red, White & Blue Elephant Doing Selling Hondas?